Every once in a while, and for reasons our mortal minds can't understand, the gods decide to take pity and smile on us. Maybe a beautiful woman or man strolls into our lives. Maybe The Philadelphia Story is playing on an airplane we’re on. Or maybe, just maybe, Chael Sonnen—the court jester, carnival barker, and Charlie Kaufmann of MMA—decides that every day for the next three weeks leading up to his fight against Mauricio “Shogun” Rua, he’s going to write a new poem on the subject of his choosing and publish it on the Internet for all the world to see. 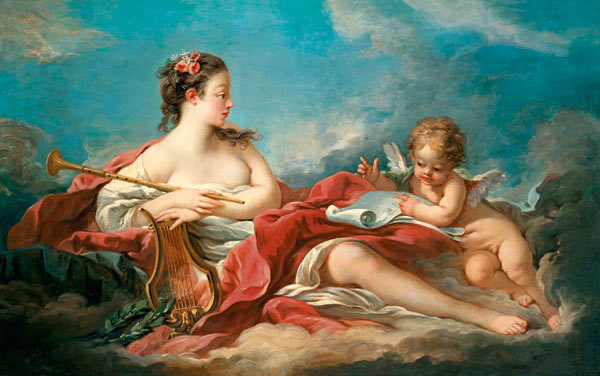 Such a turn of events could make a believer out of even the most devoted of atheists. Christopher Hitchens may have died too soon. Today Fox Sports published the first of Sonnen’s poems, and it’s just what we’d hoped and expected it would be: seven boasting, brass-filled couplets celebrating all things Chael Sonnen and denigrating anyone who’s ever thought about fighting him or who he’s ever thought about fighting. It's a small rhyming gem that walks a line between the early work of Muhammad Ali and ‘Twas the Night Before Christmas. And while Sonnen doesn’t have the gift for narrative that Ali had (for proof, check out then-Cassius Clay’s 1963 prediction for his upcoming fight with champion Sonny Liston, a miniature masterpiece of combat that belongs right up there with the Iliad for sheer invention), and of course he can’t compete with Clement Clarke Moore (who made a bland non-story about Santa Claus so compelling people are still pretending they have it memorized 200 years later), what he does have that those two men lacked is a post-modern, late-capitalist ability to multitask. Where Ali focused on Liston and Moore stuck with St. Nick, Sonnen uses the present to look toward the future: the self-made huckster genius at it again, promoting two fights at once—his actual fight against Rua in three weeks and his much-wished-for hypothetical fight against Rua’s mentor, Wanderlei Silva, at a time to be determined. More than any athlete working today, Sonnen has an innate sense for the sale, and that sense is evolving every day into something more subtle and cunning. In the past, like a normal human being, he focused his promotional attention on the fighters he was getting ready to fight. Ever since he got the call to fight Rua, though, he’s barely mentioned the former UFC champion, focusing his energy instead on Wanderlei, ginning up antagonism with a man he isn’t fighting in a brilliant attempt to sell two fights for the price of one. 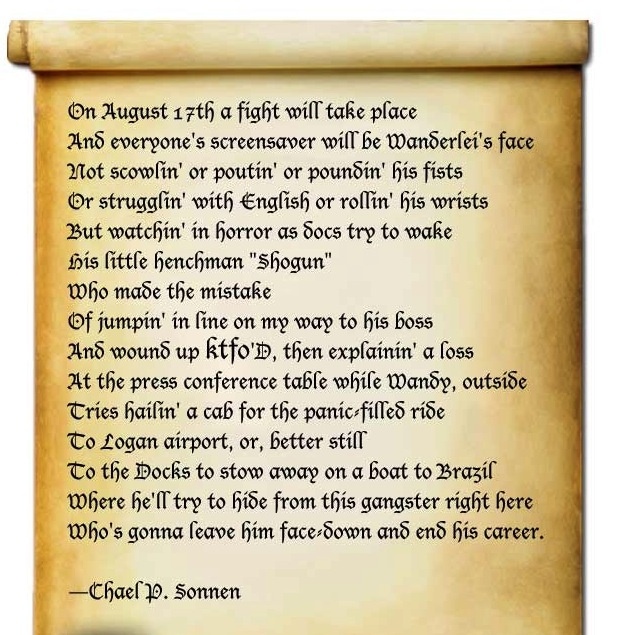 “On August 17th a fight will take place,” Sonnen's poem starts. “And everyone’s screensaver will be Wanderlei’s face.” Two lines in and Sonnen has already menitoned Silva, the man he won’t be fighting. Shogun, meanwhile, doesn’t even show up until the second third of the poem, and even then only as Silva’s “henchman,” a mere distraction to Sonnen on his way to the prize he really wants. It’s a brilliant rhetorical device. First, it goads Silva into fighting him in the future, a big-money fight that will be even bigger the more the two men antagonize each other. Second, it gets under Shogun’s skin by reducing him to a bit part in Sonnen’s epic and diminishing him, both as an opponent and a man. In most works of literature, henchmen are rarely even spoken of by name, because, why bother? By focusing his attention on Silva while making only one passing and dismissive mention of Rua, Sonnen is calling out Rua out as an irrelevant figure in a great historical drama. And no one likes to be called out as irrelevant. Lastly, Sonnen's strategy builds up the half-focused/half-scattershot legend of Chael P. Sonnen, the fighter everyone likes to dismiss as just a talker but whose talk everyone in the end gives in to. Sonnen has built a reality where he can call out three or four fighters at the same time and make his agitation and personal animus seem simultaneously real and ridiculous. And if they're smart, the fighters he calls out recognize how fruitful a fight with Sonnen could be. Say what you will about Sonnen; he sells tickets. A fight with him may not do much for a fighter’s spot in the rankings, but it does quite a bit for the expansiveness of that fighter’s wallet. In fact, now that Sonnen's poetry project has gone public, I wouldn’t doubt that some fighters are calling their agents right now to try to get their names into one of his upcoming couplets. Poetry is once again a profitable venture.